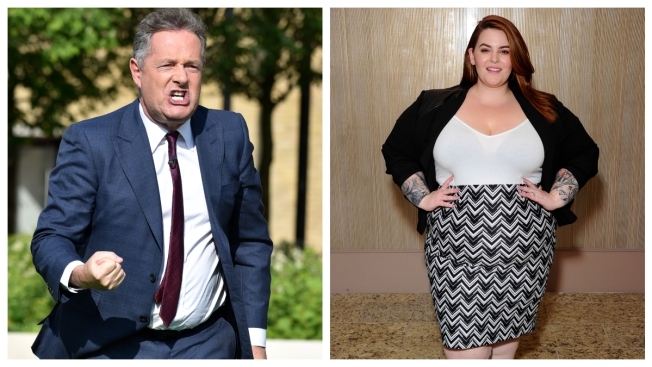 Plus-Sized Model Responds After Piers Morgan Slams CosmoUK Cover as "Dangerous" and "Misguided"
Piers Morgan lashed out at CosmoUK for putting a plus-sized model on the cover. Plus-sized model Tess Holliday is happy to be this month's cover subject of CosmopolitanUK. And she doesn't care what the haters think... including outspoken British journalist and television host Piers Morgan. Holliday first took to Twitter to express her glee about being a cover subject. "Phew, I’m literally a COSMO GIRL!! Can’t believe I’m saying that! Thank you @CosmopolitanUK for this incredible opportunity If I saw a body like mine on this magazine when I was a young girl, it would have changed my life," Holliday wrote. But Morgan took to Instagram to berate the cover and its editors for putting the plus-sized model on its cover. "As Britain battles an ever-worsening obesity crisis, this is the new cover of Cosmo. Apparently we’re supposed to view it as a ‘huge step forward for body positivity.’ What a load of old baloney," Morgan wrote. "This cover is just as dangerous & misguided as celebrating size zero models." Holliday was quick with a response of her own. "To everyone saying I’m a burden to the British health care system, I’m American so you don’t have to worry about my fat a--," Holliday wrote on social media. "Worry about what horrible people you are by whining about how me being on the cover of a glossy magazine impacts your small minded life."